Synthetic peptide within Human alpha Tubulin aa 1-100 (N terminal). The exact sequence is proprietary. WB- HeLa, HEK-293, HepG2, Caco2, NIH/3T3, PC-12, RAW 264.7, PC-12, C6 Jurkat and HEK-293T whole cell lysates; human fetal kidney lysate; Mouse and rat brain lysate; Pig skeletal muscle lysates. IHC-P: Pig kidney tissue; rat kidney tissue; mouse kidney tissue; human breast cancer tissue. IHC-Fr: Rat kidney tubule tissue. Flow cyt: HepG2 cells. IP: HeLa whole cell extract. ICC/IF: HUVEC, HeLa and 293 cells. Our Abpromise guarantee covers the use of ab52866 in the following tested applications. WB 1/1000 - 1/50000. Detects a band of approximately 50 kDa (predicted molecular weight: 50 kDa). The association of AJAP1 with microtubules in HUVECs is lost upon microtubule destruction. Treatment with 12.5 µM nocodazole for 24 h shows destruction of the microtubule network and loss of AJAP1 tubular localization. For a negative control, HUVECs are treated with DMSO for 24 h. Cell nuclei were counterstained with DAPI (cyan). Microscope: Zeiss LSM 780; objective lens: 63×/1.40 oil; scale bar: 25 µm. 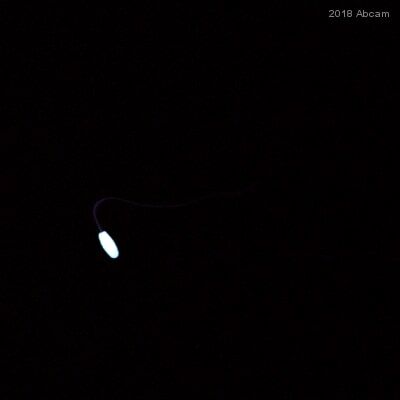 Incubated overnight at 4°C with ab52866. Immunofluorescent analysis of 4% paraformaldehyde-fixed HeLa (human epithelial cell line from cervix adenocarcinoma) cells labeling alpha Tubulin with ab52866 at 1/500 dilution. The cells were permeabilised with 0.1% Triton X-100. Anti-rabbit Alexa Fluor® 488 (ab150077) at 1/400 dilution was used as the secondary antibody (green). The confocal image shows microtubules staining on HeLa cell line. The nuclear counter stain is DAPI (blue). Tubulin is detected with ab7291 (anti-Tubulin mouse mAb) at 1/500 and anti-mouse AlexaFluor® 594 (ab150120) at 1/500 dilution (red). 1. ab52866 at 1/500 dilution followed by anti-mouse AlexaFluor® 594 (ab150120) at 1/500 dilution. 2. ab7291 (anti-Tubulin mouse mAb) at 1/500 dilution followed by anti-rabbit Alexa Fluor® 488 (ab150077) at 1/400 dilution. Immunohistochemistry analysis of paraffin-embedded Pig kidney tissue labeling alpha Tubulin with ab52866 at a 1/1000 dilution. Cytoplasmic staining on Pig kidney tubule and weak on glomerulus shown. Anti-Rabbit HRP (ab97051) used at a 1/100 dilution. Counter stained with Hematoxylin. 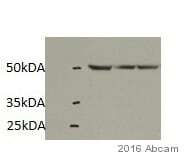 Inset image: negative control obtained using PBS instead of ab52866, secondary antibody is Anti-Rabbit HRP (ab97051) at 1/100 dilution. alpha Tubulin was immunoprecipitated from 1mg of HeLa (human epithelial cell line from cervix adenocarcinoma) whole cell extract using ab52866 at 1/30 dilution. 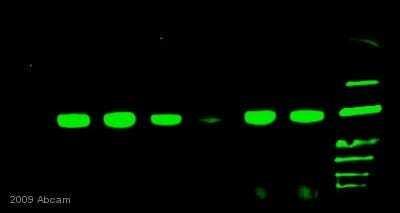 Western blot was performed from the immunoprecipitate using ab52866 at 1/1000 dilution. Anti-Rabbit IgG (HRP), specific to the non-reduced form of IgG, was used as secondary antibody at 1/1500 dilution. Lane 1 Hela whole cell extract, Lane 2 PBS instead of whole cell extract. 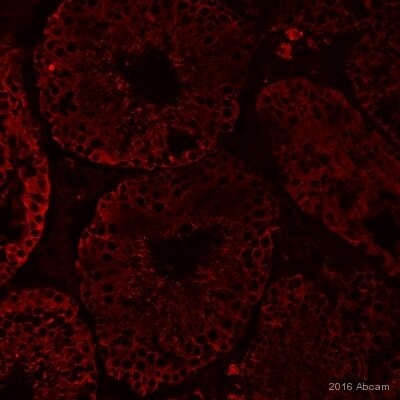 Immunohistochemical analysis of rat kidney tubule tissue, staining alpha Tubulin with ab52866. Immunohistochemistry analysis of paraffin-embedded Rat kidney tissue labeling alpha Tubulin with ab52866 at a 1/1000 dilution. 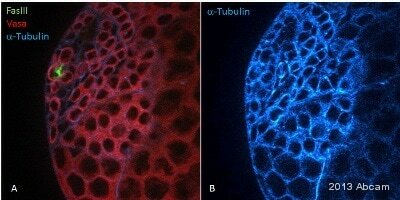 Cytoplasmic staining on Rat kidney tubule and weak on glomerulus shown. Secondary antibody Anti-Rabbit HRP (ab97051) used at a 1/500 dilution. Counter stained with Hematoxylin. Inset image: negative control obtained using PBS instead of ab52866, secondary antibody is Anti-Rabbit HRP (ab97051) at 1/500 dilution. Flow cytometry analysis of 2% paraformaldehyde fixed HepG2 (human liver hepatocellular carcinoma cell line) cells labeling alpha Tubulin with ab52866 at 1/130 dilution (red line). Secondary antibody used is a goat anti rabbit IgG (FITC) at 1/150 dilution. The isotype control is rabbit monoclonal IgG (black line). The unlabeled control is cells without incubation with primary and secondary antibodies (blue line). 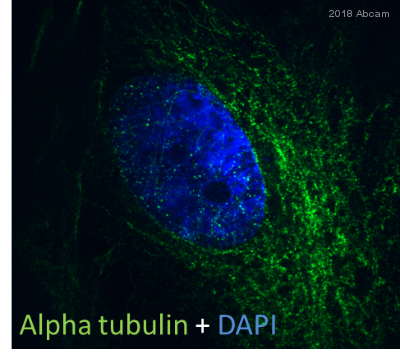 ab52866 staining alpha Tubulin in 293 Human embryonic kidney cells by ICC/IF (Immunocytochemistry/immunofluorescence). Cells were fixed with paraformaldehyde and blocked with 10% serum for 2 hours at 23°C. Samples were incubated with primary antibody (1/200 in 0.5% saponin) for 2 hours at 23°C. An Alexa Fluor®555-conjugated Goat anti-rabbit IgG polyclonal (1/500) was used as the secondary antibody. Nuclei were counterstained with DAPI. Immunohistochemistry analysis of paraffin-embedded Mouse kidney tissue labeling alpha Tubulin with ab52866 at a 1/1000 dilution. Cytoplasmic staining on Mouse kidney tubule shown. Secondary antibody Anti-Rabbit HRP (ab97051) used at a 1/500 dilution. Counter stained with Hematoxylin. Immunohistochemistry analysis of paraffin-embedded Human breast cancer labeling alpha Tubulin with ab52866 at a 1/1000 dilution. Cytoplasmic staining on cancer cells shown. Secondary antibody ab97051 Goat Anti-Rabbit IgG H&L (HRP) used at a 1/500 dilution. Counter stained with Hematoxylin. 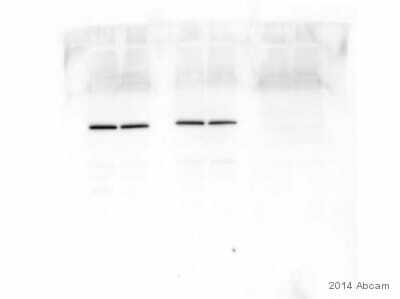 This blot was produced using a 4-12% Bis-tris gel under the MOPS buffer system. The gel was run at 200V for 50 minutes before being transferred onto a Nitrocellulose membrane at 30V for 70 minutes. The membrane was then blocked for an hour using Licor blocking buffer before being incubated with ab52866 overnight at 4°C. Antibody binding was detected using Anti-Rabbit Alexa Fluor® 790 (ab175781) at a 1:10,000 dilution for 1hr at room temperature and then imaged using the Licor Odyssey CLx.